Opportunities Management, New Integrations, UI Updates, and More! 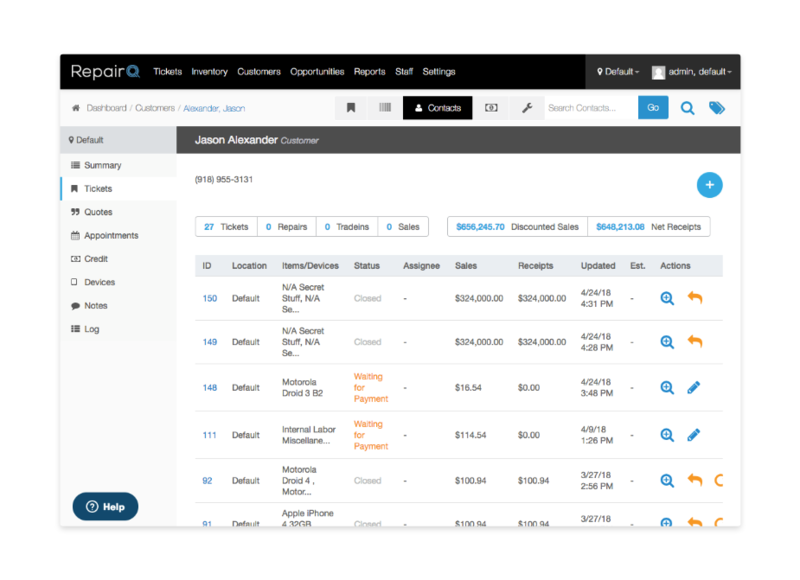 Spring is in the air and RepairQ is hitting the ground running with a brand new release, which features the first batch of Opportunities related functionality, user interface improvements, new promotions, and much more! 1) Inventory is not consumed. 2) Quotes are not included in revenue reports. Converting a quote to a working ticket is a one-click process, and inventory stock is pulled at the time of conversion. Quotes can have their own workflows, leveraging the ticket status system to track progress, and the automated notification rules can be configured specifically for quotes. 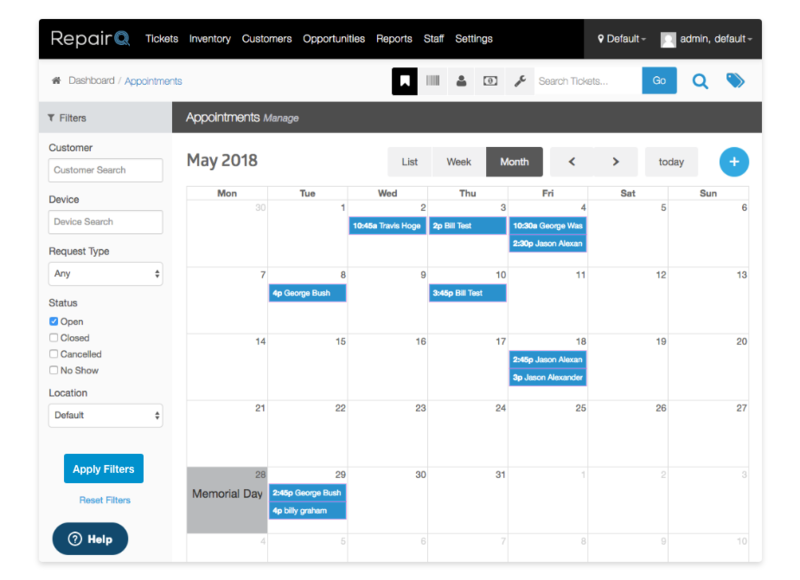 “When would you like to come in?” Now with appointment scheduling built into RepairQ, you can book appointments for customers and leads, create new tickets from appointments, and track your upcoming appointments on an easily accessible calendar view. Appointments are created with the customer’s request and device information so that when the customer checks in for their appointment, creating their ticket for service is a push-button process. You can also create a new lead record in the process of booking an appointment, so if the appointment does not convert, you retain the customer’s information and device info in the leads list so that you can perform targeted marketing. Appointment notifications are configurable, including appointment reminders, and you can keep track of appointment statuses and resolutions with the customizable status system. Managing your appointment calendar rules is highly customizable, and it honors your store hours, holidays, time slot durations, concurrent appointments allowed, and more. We’re excited to announce that starting with Release 1.15, RepairQ will be upgrading its User Interface! You will notice a fresh new look starting to unfold, beginning with Appointments, Contacts, and Company Settings, along with a few global elements. If you want to read more about these improvements and the future of the look of RepairQ’s UI, click here! We have also restructured our pricing plans. We won’t ever force you to switch because our goal is to continually empower our users, and this is no exception. Simply put, you can keep your Standard or Enterprise plan for life. Don’t change until you are ready. We are now offering three simple plans that each effectively fill industry needs for every stage of business. Users are included in the base price, and we are also adding options for annual pricing and special incentives that will save you money over time (up to 20% off). Check out all of the new pricing plans and promotions on the pricing page. Managing large organizations is now much easier, and you can configure specific settings for local and regional differences. Managing large organizations is now much easier by allowing users to configure specific settings for local and regional differences. RepairQ is integrated with one of the industry’s leading electronic diagnostic tools. Pervacio runs comprehensive automated and semi-automated tests, and provides a comprehensive report with test results as well as suggestions for improvement to areas like battery life. 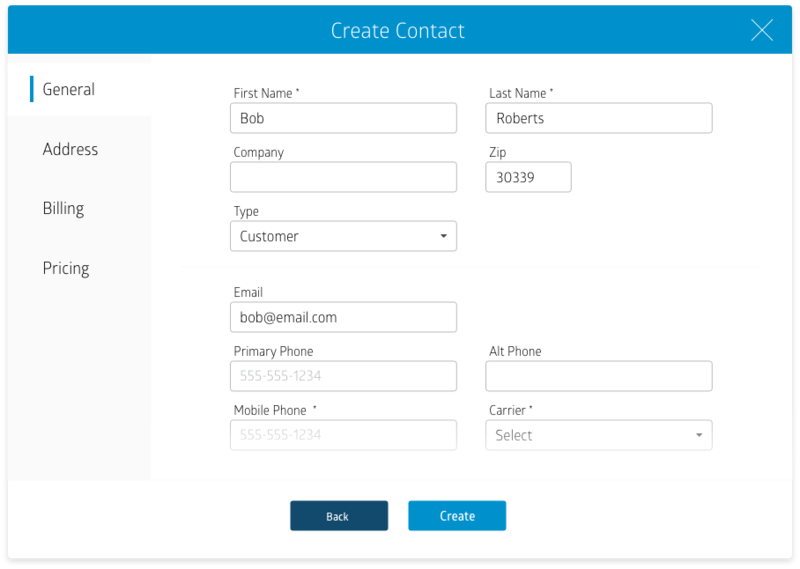 RepairQ pulls report data via device serial number and saves it into a new custom form field type which you can add and enforce with our powerful custom forms system. This gives you the ability to save, view, print electronic test results for any RepairQ sale, repair, refurb, or trade-in. Working with Warranty Life, RepairQ automates the process of selling a new advanced protection offering for the industry. Through our integration with Warranty Life, you can now offer three new bundle offers to your customers and you can display and/or promote them directly through Qpop with the latest release! When a warranty bundle offer is available for a device repair or sale, the offers are displayed to the customer on Qpop so that the customer can follow along with the pitch. A new purchase order integration is available with MyCoolCell in RepairQ! The integration supports purchase order building through live stock checking and pricing, and placing an order from RepairQ purchase order is a push-button process. A new purchase order integration is available with MobileSentrix in RepairQ! The integration supports purchase order building through live stock checking and pricing, and creating a shopping cart with MobileSentrix from RepairQ purchase order is a push-button process. Status updates from MobileSentrix are pushed back to RepairQ so you can stay on top of status updates, shipments, and more! Our newest release is brimming with other updates, features, fixes, and improvements that aren’t listed here. Read more about the switch location feature, Accounting Journal improvements, tax-inclusive pricing, new integrations, and more on our Knowledge Base article here.